These articles provide an overview of different purposes and tools, accompanied by examples from California cities and counties. 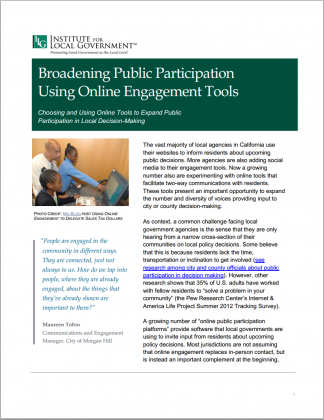 Local governments frequently use technology to engage their communities in public meetings and the decision-making process. 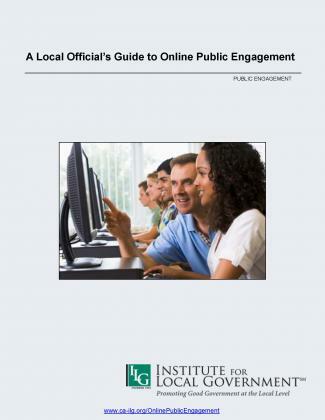 Many such options are outlined in new resources available from the Institute for Local Government (ILG). A comprehensive overview of key purposes, strategies and examples for multiple modes of online and digital engagement. A study of digital engagement examples, issues and implications from Alissa Black of the New America Foundation’s Civic Innovation program.